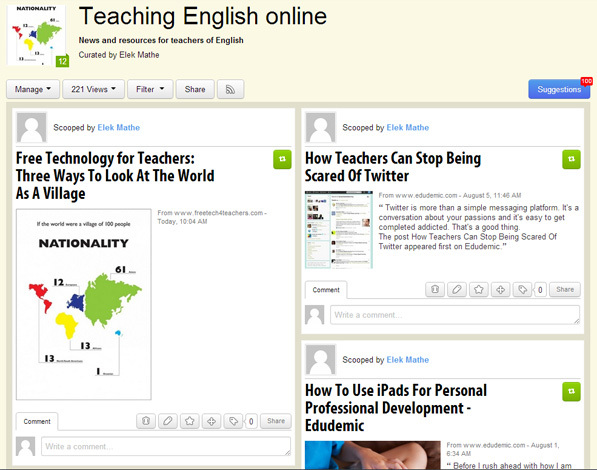 Just in case you were wondering where to find news and resources about teaching English online… let me suggest my Scoop.it page, called Teaching English Online. I’m planning to update it regularly (I know, I know…) with relevant links – give it a try and let me know if you like it. The page also has an rss feed if that’s your preferred way of reading stuff online. Also, I’ve just set up another page there for learners of English; it should have some content very soon. I still haven’t made up my mind whether I prefer paper.li or Scoop.it (while I know that they are different so a comparison might not be appropriate) but these days I seem to lean towards the latter. We’ll see :).